GONG BADAK, TERENGGANU, 18 October 2014 – A balance has to be struck between Free Trade and Government Intervention as the country aims to become a high-income nation within the next six years. 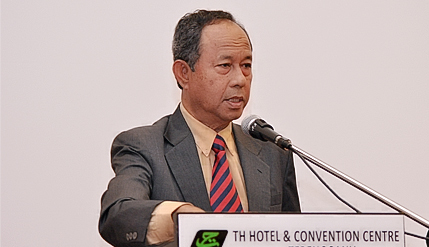 Malaysian Institute of Economic Research (MIER) Chairman Tan Sri Dr Sulaiman Mahbob said business should be encouraged to thrive by having open competition. He, however, cautioned that the authorities may have to step in to prevent a few traders from controlling the market. Giving his keynote address at the opening of the three-day Ninth National Conference on Malaysian Economy (PERKEM) 2014 here today, he said Malaysia should have a fair-trade law if corporate good-governance is to become credible in the run-up to the year 2020. The theme of the conference was Fair Economic Governance: Towards A High-Income Economy. Sulaiman, the former EPU Director General in the Prime Minister’s Department and is now Chairman of Jambatan Kedua Sdn Bhd explained that Good Governance and Integrity are very important to the private sector if businesses are to be seen credible in their dealings with the government. Fair trade and business standards are vital to Malaysia if it wants to achieve developed nation status. He said privatisation of state-owned entities should have been supervised by proper corporate governance but there was none. There are also other aspects of good governance that must be addressed as well such as business standards, consumer protection and price control, Sulaiman said. When privatisation of the utilities such as Telecoms and the highways started thirty years ago, regulatory economics had not been introduced. “We might have first world infrastructure but we have third world mentality. Institutions are not ready, the laws are not ready. But our leaders were in a hurry (to privatise in the 1980s),” he said. Despite being mooted since the early 1990s, Malaysia did not have any anti-competition laws until 2010 when the Malaysia Competition Commission (MyCC) was established. Its main role is to protect the competitive process for the benefit of businesses, consumers and the economy. He justified the setting up of business standards and consumer protection bureaus to deter monopolies and price-fixing. He said although the private sector always clamour for free trade, they might also want a monopoly once they got what they wanted. That is why consumer watch-dogs are important to curb monopolies, cartels and price-fixing. “In UK they have Fair Trade Laws, which we don’t have. So we have cartels and anti-competition,” he said. We would be closer to becoming a developed country with an increased importance of a market economy if we have such safeguards to our economy. However a market economy can fail and this is where the government has to step in to ensure fairness of market. But then when the interests of consumers are taken into account, price control is introduced under the Price Control Act 1946. While price control may bring relief to consumers in the short term, traders can create artificial shortages and hike up prices before price control is enforced. So now price control is enforced all year round and is quite predictable; such as during festive seasons and shortages. A balance has to be struck and regulatory bodies should only support efficiency, Sulaiman contended. PERKEM is an annual event organised by the Faculty of Economics and Management (FEM) UKM and hosted by the different states. The conference provides a platform for researchers, policy makers and those who follow Malaysia’s economic development through the presentation of research findings that focus on various issues pertaining to economic development, growth and business environment. Also present at the start of the conference were PERKEM chairman Dr Mohd Adib Ismail and School of Economics chairman Assoc Prof Dr Tamat Sarmidi who also acted as the moderator.